My sermon from the Sixth Sunday of Lent (March 25, 2018) on Mark 11:1-11. Listen to the recording below or read my manuscript below. Since I moved to New Jersey, the number of parades I’ve randomly run into is zero. But when I was living in New York City, I wandered into parades all the time. 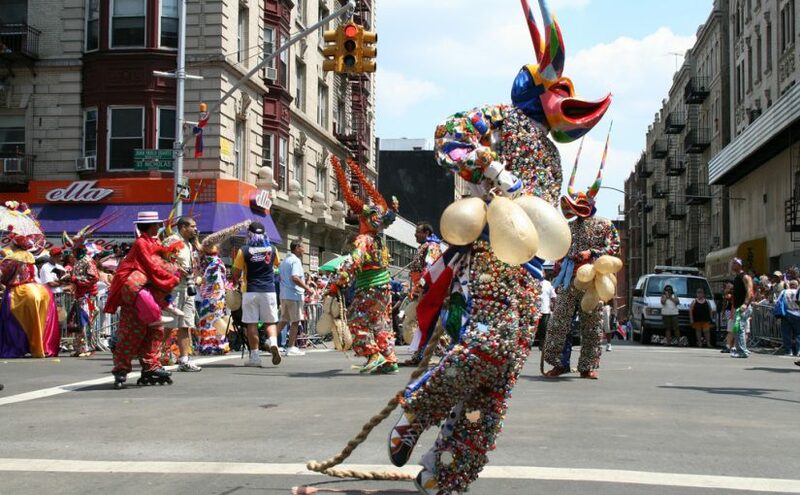 In fact, I can’t even count how many times I left my apartment in the Washington Heights neighbor of Upper Manhattan and ended up in the middle of something like the Dominican Day Parade. I would suddenly find myself stuck between a giant float blaring reggaeton music and dozens of traditional male Dominicans dancers wearing full body beaded costumes with the head of a bill. All I wanted to do was to get to the other side of Broadway but police barriers, bachata dancers, and sidewalks full of people waving tiny American and Dominican flags always stopped me in my tracks. My first response to this little setback was usually the normal New Yorker and New Jerseyan response when someone or something gets in our way. But when you run into a parade with tens of thousands of participants and parade-watchers, getting mad never changed anything. I would just refocus, look for a break in the parade and an open police barrier, and then try to dash to the other side. Yet in that process of wiggling and squeezing and maneuvering my way through the crowds, I found myself actually watching the parade. The bright colors on the floats, the grace of the dancers, and the boisterous wordplay from every single float based entertainer, enticed me. I would always end up stopping, usually at the front of the crowd, and watch everything just go by. Someone near me would hand me a tiny Dominican and American flag, and I would wave them to beat of every song from every float that went by. Then, after a bit, the alarm bells of my internal to-do list would remind me that I was super late – and I’d dash across the street, getting to the otherside. My time table for that day was usually shattered. I would be late to everything that day. But, for all intents and purposes, that’s the only thing about my day that would change. My to-do list still got done. I’d still get to where I needed to be. And as much as I was enthralled by the parade, I always left it pretty much as the same kind of person I was before. That unexpected parade ended up changing very little of my everyday-kind-of-life. When I hear Mark’s version of Jesus’ journey into Jerusalem, I often wonder about that person who unexpectedly stumbled onto his parade. Imagine for a moment being a shopkeeper, or a farmer, or a beggar, or a pilgrim, visiting the city for the great religious festival of Passover. You’d try to cross a busy city street but you couldn’t because of this man riding a colt. In front of him would be people waving palm branches and putting their clothes on the ground to minimize the people kicking up all dust. Others around them would be shouting a very odd kind of phrase: saying Hosanna – which could mean “rejoice” but also means “save us.” On first glance, this parade would appear like it was pretending to be something bigger. Unlike Matthew and Luke’s version of this story, Jesus’ parade isn’t really puffed up. No where in Mark’s text does it talk about a large crowd being there. And Jesus doesn’t make any grand statements about prophets or judgments against the city. Mark keeps Jesus’ parade small because, in some ways, that’s who Jesus appears to be in this moment. He isn’t, like a great general or king, riding a big and powerful horse. He’s surrounded by followers who are waving palm branches and who don’t own swords or weapons or armor. And when Jesus’ parade is finally finished, Jesus does a small thing. He does teach or speak or tell a story. He takes a tour of the Temple, sees everything, and then immediately leaves the city. The grandness of this moment is very tempered in the gospel according to Mark. For the traveler or begger or city-dweller watching this “pretend-parade,” I imagine they would be annoyed that they were being delayed. But that, to them, would be all this parade was. They would still get to do everything they needed to do. And this vision of a man on a colt would shortly fade, barely registering as a memory the following day. The smallness of this Jesus moment would be, for the person interrupted by it, just a tiny blip in the story of their everyday life. Now, as a church, we tend to treat this Palm & Passion Sunday as an opportunity to highlight a truth about who we are. We are, as human beings, the same people who shout with joy when God shows up, and then respond with “crucify!” the minute God’s values suddenly clash with our own. By holding together these two events that are separated in Mark by several chapters, we imagine that Mark is making a statement about the one kind of person that exists in the world. Yet the smallness of Mark’s parade introduces to us another option. We are the ones who shout “crucify” but we are also that person in the crowd going about their daily life. We are living in the only way that they can and we barely notice the parade that interrupted our day. We saw a man on the colt but since he didn’t seem important, we didn’t ask for his name. We saw the others waving of branches but didn’t ask what was it those people hoped for. We heard the cries of “Hosanna!,” of people asking to be “saved,” but we didn’t care enough to ask what they wanted to be saved from. We were there instead, on the sidelines, possibly intrigued by what we saw – but not enough to ask who this Jesus is. Rather, we were so caught up in our everyday life, that we didn’t even notice when Jesus rode in. Because Mark’s gospel, on this Palm Sunday, created something that Rev. Benjamin Dueholm calls a “null moment.” A “null moment,” to me, are those moments in Jesus’ story when a “lukewarm” or “inattentive” experience of Jesus is something that we can totally have. I don’t know anyone who can spend every second of every moment of their life focused on God alone. Instead, we live daily lives full of experiences, struggles, and joys where when we don’t intentionally engage with our faith at all. All of us are caught up in the everyday busy of everyday living. And when some random parade unexpectedly crosses our path, that doesn’t always change what comes next. But just because we have these “null moments” with Jesus, doesn’t mean that Jesus has “null moments” with us. Because as we hear in today’s story, Jesus looked around at everything. He saw what was in God’s Temple. He knew where that colt would be. He saw the people in the crowd who responded to him and those who’s daily life was barely interrupted by his presence. Jesus saw all of us in all the ways we can possibly be – from the fervent disciple waving palm branches to the member of the crowd shouting “crucify” and even being that indifferent person hanging out on the sidelines. Jesus saw all that we can possibly be – and he still loved us anyways.